When German spy Josef Jakobs descended from the heavens on the night of 31 January, 1941, he brought with him a load of trouble for one James John Rymer of London. Josef Jakobs had been equipped with a National Identity Card in the name of James Rymer of 33 Abbotsford Gardens, Woodford Green. The ID card was notable for many reasons, the most glaring being the registration number 656/301/29. Registration numbers always started with a letter prefix and Josef's was clearly an odd one. As it would turn out, the registration details had been sent over to the German Abwehr (German Intelligence Service) by double agent SNOW, with the blessing of MI5. There was, however, one key difference between the information on Josef's card, and the information sent to the Abwehr - the registration number. The Brits had sent over ARAJ/301/29, but the Germans had, for some unknown reason, seen fit to alter that to 656/301/29. The officers of MI5 were bemused by the substitution. Months later, in late July 1941, MI5 was in the final stages of arranging a court martial for Josef Jakobs. Lt. Col. William Edward Hinchley-Cooke, who was in charge of the preparations, decided that he needed a paper trail around the Identity Card. As a member of MI5, he likely knew that SNOW had sent the details on the card over to the Germans but... given that Hinchley-Cooke was about to testify at a court martial, he probably decided that he needed background information from a more legitimate source. Or at least a source that he could freely talk about during the court martial. On 25 July, 1941, Hinchley-Cooke rang up Detective Inspector Douglas Grant of Special Branch, an arm of the Metropolitan Police that worked closely with MI5. Hinchley-Cooke asked Grant to dig a bit deeper into the legitimacy of the Ration Card and the Identity Card found in Josef's possession. Good old fashioned police work was just up Grant's alley. He agreed with Hinchley-Cooke that the information on the Identity Card was a tad suspicious because the last Electoral Register listed a family named Cox at the 33 Abbotsford Gardens address. Grant began his investigations with a bit of background digging. He popped round the National Registration Office for Wanstead and Woodford and learned that the Identity Card found in Josef's possession was clearly a forgery. There were several discrepancies with authentic cards, but the lady did admit that the information on the card was a mixture of accurate and inaccurate information. 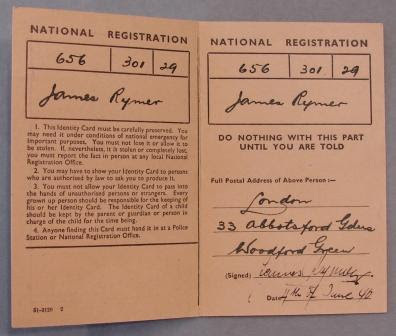 The registration number was clearly wrong but there was a James John Rymer (ARAJ/301/29) who did reside at 33 Abbotsford Gardens. He had moved there on 29 October, 1940, which meant that the date on the bottom of Josef's card was inaccurate. Armed with that information, Grant drove round to Abbotsford Gardens and rang the bell of No. 33. He was greeted by an elderly woman who likely looked a bit concerned upon learning his identity. It was never a good thing to receive a visit from the police. Grant asked her if one James Rymer resided there and the woman admitted that James was her son. He worked for the BBC and would be home around 5:00 p.m. Grant thanked the woman and told her that he would call again when James was home. Searching out the nearest phone box, Grant rang up Hinchley-Cooke and reported his findings. Hinchley-Cooke asked him to get more information from Rymer but without letting him know how the bogus ID card had come into the possession of the police. When James arrived home, he was probably a bit surprised to find a policeman on his doorstep. Without much ado, Grant showed James the questionable Identity Card. James categorically denied that he had ever seen that ID card before. He also stated that the signature was not his. James said that he had been issued his ID card in September 1939, had never lost it and had never applied for a new one. Grant also learned that James was a radio maintenance engineer at the BBC which made him perk up his ears a bit. His police antenna were working overtime - suspicious Identity Card... guy with radio knowledge. Was it possible that Rymer was an enemy agent? He was altogether a bit too cool, calm and collected for Grant's liking. After inspecting several other identity documents that Rymer showed him, Grant stood up and took his leave of James and his mother. At the door, Grant turned to Rymer and said "I might see you again", to which Rymer coolly replied, "I hope we both shall be still the same side of the fence when we meet again". After leaving 33 Abbotsford Gardens, Grant rang up Hinchley-Cooke again and shared his suspicions about Rymer. Hinchley-Cooke reined in the eager copper and told him that no immediate action should be taken regarding Rymer. Hinchley-Cooke knew that Rymer was an innocent man. James was born on 1 November, 1900 in Bow, London. He was the only child of hairdresser James Kinggett Rymer and his wife Florence Sarah Ann Richards. Young James must have been a bright young lad for in 1903, at the age of 3, he was enrolled in Roman Road School in the Tower Hamlets area of London. 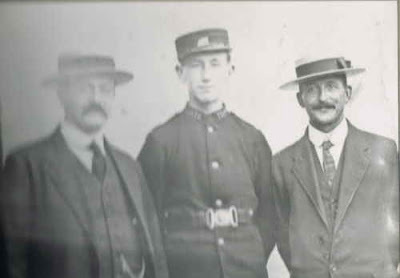 At the outbreak of World War I, James was a tad young to enlist and by 1917, he was an assistant postman with the London Postal Service. In early 1918 however, James enlisted with the Merchant Navy, receiving his Seaman's Certificate on 8 March, 1918. As a member of the Merchant Navy, James was flirting with danger. The war with Germany was still raging, but James was a lucky lad and survived the war unscathed. 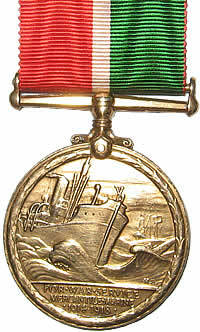 Because James sailed through dangerous waters, he was awarded Mercantile Marine Medal as well as the British Medal. It would appear that James spent most of his young adulthood serving in the merchant marine. This was not altogether surprising. His paternal grandfather was a sailmaker and his paternal great grandfather was a ship's carpenter. Apparently the Rymer family, with the exception of James' own father, had a long association with the sea. On 20 September, 1929, James received a certificate which stated that he had Proficiency in Radiotelegraphy, indicating that he may have been serving in the signal's office on board his ships. Depending on his location in 1931, it might have taken him a few weeks or a few months for him to receive word that his father had passed away on 17 March, 1931. James Sr. let his wife around £1100, a moderate sum back then. Later that year, on 27 May, 1931, James was once again off to sea, serving on the newly minted SS Empress of Britain. He sailed with the Empress for the next four years, eventually striding ashore in October 1935. When James left the sea behind him, he moved in with his mother, residing at 49 Stafford Road in the borough of Bow, London. James likely picked up his job with the BBC fairly quickly and was able to supplement the household income. Despite the fact that James was an only child and apparently never married, he did have a rather large extended family who lived in East London. His father had eight siblings and they all went on to have families as well. In late October, 1940, James and his mother moved to 33 Abbotsford Gardens in Woodford Green. Perhaps they were bombed out of their previous flat, or perhaps James was moving closer to his job. As we've seen, the peaceful life of James and his mother was disturbed on the afternoon of 25 July, 1940, by the visit of Detective Inspector Douglas Grant. James' mother was only 70 years old, but the stress of a visit from the police may have been too much for her. Two days after Grant left the flat, Florence Sarah Ann Rymer passed away, leaving her son about £900. James John Rymer eventually moved to Eastbourne, along the southeast coast of England, where he passed away in the late summer of 1970. James likely never knew that his name had been associated with a German spy. News reports after Josef's execution never mentioned the name found on his forged Identity Card. Why MI5 chose James' name and address to send to the German Intelligence Service remains a mystery.